At first pass, Philadelphia‘s Elfreth’s Alley looks like any other quaint, well-preserved historic street in a typical northeastern U.S. city. Look closer, though, and it’d apparent that the rowhouses are much older than the 19th-century homes found in New York’s West Village or Boston’s Beacon Hill. 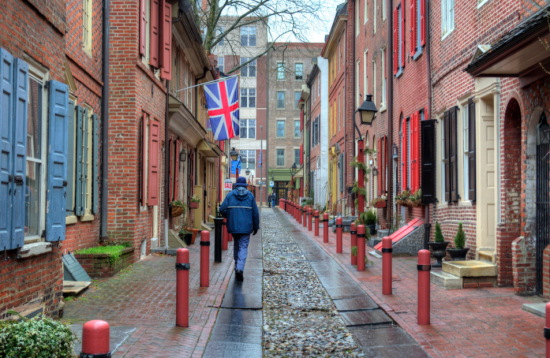 That’s because Elfreth’s Alley welcomed its first residents in 1702: the block-long lane is the oldest continually occupied residential street in the United States. Although the street is afforded protection by its National Historic Landmark status, escalating, ultra-bland development in Philly’s historic core means that it, and the surrounding urban fabric, must protect their assets by conceiving of a future that balances site-sensitive private development with public amenities that cater to Philadelphians. Old City District, a city-sponsored historic preservation group, commissioned planning consultants RBA Group and Philly–based Atkin Olshin Schade Architects to stake out a future for Old City. Vision2026 is intended to complement the City Planning Commission’s Philadelphia2035 plan and, in a nod to local heritage, will coincide with the 250th anniversary of the signing of the Declaration of Independence. 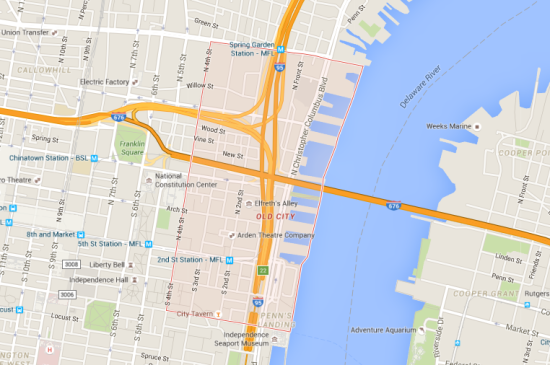 To some, Old City is thought to be bound by the Delaware River to the east, 4th Street to the west, Vine Street to the north, and Walnut Street to the south. The Old City District’s definition is narrower, encompassing a 22-block area bounded by Front Street to the east, 6th Street to the west, Florist Street to the north, and Walnut and Dock streets to the south. The genesis of Vision2026 was a community discussion on development goals that began in January 2015. Traffic studies and user surveys evinced a desire for standard-issue urban features: Quality public space, public transportation access, better bike infrastructure, stores that serve the community’s needs (especially a grocery store), and a development vision that encourages new investment without overriding the neighborhood’s charm. The suggestions take a deep dive into specifics. To reduce car traffic, Vision2026 suggests improving bike infrastructure (addressing a lack of bike lanes and inconsistent linkage to the waterfront, for example) concurrently with initiatives to consolidate commercial package delivery, privilege commercial loading access over private parking, and promote the use of car shares. The population of Old City has grown 16 percent since 2000, and the area needs Complete Streets (streets designed for safe use by pedestrians, cars, and bicycles alike) to enhance the neighborhood’s vitality. A proposal for a 2nd Street Station plaza (the 200 block of Market Street) envisions 14-foot sidewalks flanked by an allée-meets-bike lane. The proposal suggests eliminating street lights—a counterintuitive but effective traffic-calming measure—on the 10-foot-wide stretch of road set aside for private cars. Although the vacancy rate hovers at around ten percent, studies show that, if current trends continue, the area could support an additional 122,000 square feet of retail. More than 1,000 new residential buildings in the district are proposed or currently under construction. 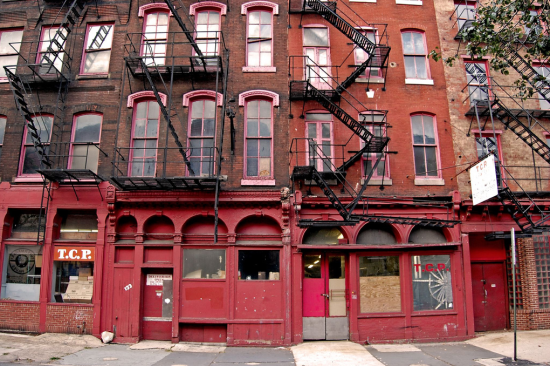 Vision2026 echoes Robert Venturi’s 1976 master plan for Old City, calling for redevelopment of the area’s Victorian commercial and industrial buildings erected between 1840 and 1890. Eight parks, including the Venturi–designed Welcome Park, are highlighted as spaces to improve and capitalize upon. Activating underused areas around the Benjamin Franklin Bridge is a priority: Proposals include an under-the-overpass market (like New York’s Queensboro Bridge, but hopefully more successful) with restaurants and vendors, as well as wayfinding improvements, especially at night, to enhance connectivity between neighborhoods rent by the interstate. Next steps include beta-testing the ideas via tactical urbanism, temporary bike lanes, and legislative action, through zoning and permitting amendments, to pave the way for concrete improvements.